Cook onions and green peppers until tender in steamer or small steam-jacketed kettle. 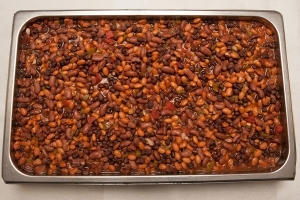 Drain canned beans in colander and rinse under cool running water to remove starchy liquid. Combine water, tomatoes, salsa, mustard, salt, and liquid smoke in a steamtable pan (12" x 20" x 4"). Add beans, onions and green peppers. For 100 servings, use 2 steamtable pans. Conventional oven: 350 degrees F for 45 minutes to 1 hour. Convection oven: 350 degrees F for 45 minutes. CCP: Heat to 145 degrees F or higher for 15 seconds at the completion of the cooking process. Serve immediately or cover and place in warmer until ready for service. Portion with 4 ounce spoodle or #8 scoop per serving. Each portion provides ½ cup of beans/peas vegetables. CCP: Hold and maintain product at a minimum temperature of 135 degrees F. Check temperature every 30 minutes. Leftovers should be covered, labeled, and dated . Quick chill within 6 hours to 41 degrees F or lower. Use USDA Foods when available. 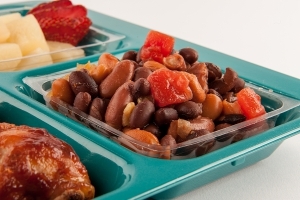 ”Culinary Techniques for Healthy School Meals: Preparing Beans and Peas“ provides seasoning and serving ideas for beans. Beans must be counted as either a vegetable or a meat/meat alternate and cannot be counted as meeting both components in the same meal.